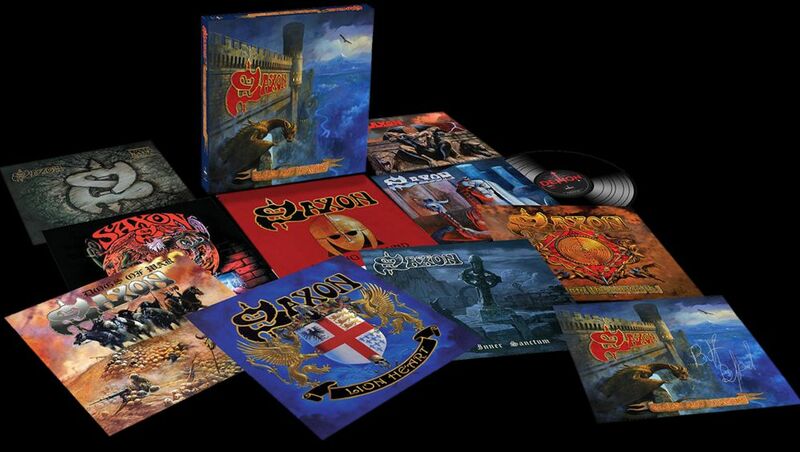 SAXON - EAGLES & DRAGONS LTD. VINYL BOX (9LP BOX) | Online Shop | Wizard LTD. Album: "EAGLES & DRAGONS LTD. VINYL BOX (9LP BOX)"
- LIMITED EDITION NINE ALBUM VINYL BOX SET! Demon Records is proud to announce the first Saxon release in a new deal: a nine album vinyl box set, containing all of Saxon’s classic studio albums released between 1991 and 2009. (Solid Ball Of Rock, Forever Free, Dogs Of War, Unleash The Beast, Metalhead, Killing Ground, Lionheart, The Inner Sanctum and Into The Labyrinth). The hand-numbered outer slipcase box features a specially-commissioned, beautiful brand new cover painting by Saxon’s artist-in-residence, the legendary Paul Gregory. All nine albums have previously only had extremely limited releases on vinyl in either Germany, Italy or the UK. We now present them on 180 gram vinyl, all with inner sleeves featuring all the lyrics.